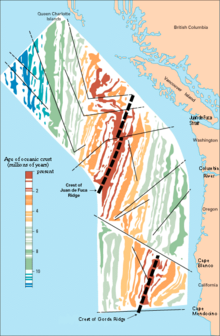 Magnetic striping mapped by oceanographic surveys offshore of the Pacific Northwest. Thin black lines show transform faults that offset the striping. Geomagnetic reversals is a change in the orientation of Earth's magnetic field. Archaeomagnetic reading have indicated that complete reversals in the earth's magnetic field have occurred with some regularity in Earth's past. Geomagnetic magnetic readings of sea floor rocks has found them to generally belong to two groups - one group has the same polarity as that of the Earth's present magnetic field and the other group has reversed polarity. When these magnetic properties of sea floor rocks were mapped over a wide region, a repeating pattern was evident. Alternating stripes of magnetically different rock were found in rows on either side of the mid-oceanic ridge: one stripe with normal polarity and the adjoining stripe with reversed polarity. The overall pattern, defined by these alternating bands of normally and reversely polarized rock, became known as magnetic striping. Rift in the ocean floor through which red-hot magma is squeezed up from the mantle. The magma solidifies with a magnetic polarity corresponding to that of the Earth's magnetic field. After a period of time, the Earth's polarity changes, that is, the magnetic north pole becomes the magnetic south pole, and so the polarity of the newly formed crust changes, too. As new magma is squeezed in, the older crust is moved out from the midocean ridge like a conveyor belt. This produces a series of strips of rock magnetized in opposite senses, with the magnetic stripes parallel and symmetrical to the ridges. Shallow-focus earthquakes occur on the ridge; intermediate and deep-focus earthquakes occur on the downgoing plate as it collides with another plate. Beginning in the 1950s, scientists began recognizing odd magnetic variations across the ocean floor. The iron-rich basalt (volcanic rock) making up the ocean floor contains a magnetic mineral (magnetite), and can locally distort compass readings. This distortion was recognized by Icelandic mariners as early as the late 18th century. Because the presence of magnetite gives the basalt measurable magnetic properties, these magnetic variations provided another means to study the deep ocean floor. As more and more of the seafloor was mapped, the magnetic variations turned out not to be random or isolated occurrences, but instead revealed recognizable patterns. It has been theorized that new oceanic crust has formed at the crest of the mid-oceanic ridge inducing spreading of the sea floor and continental drift. Geomagnetic reversal became supporting evidence for plate tectonics when it was the discovery that the Earth's magnetic field has reversed its polarity 170 times in the past. As new basaltic material is squeezed up into the midocean cracks and solidifies, it is magnetized according to the polarity of the Earth's magnetic field. If the field reverses its polarity, the strip of new material is magnetized in an opposite sense. As the oceanic floor continues to spread, the new strips of rock are carried away on either side like a conveyer belt. Using these magnetic strips as evidence of movement, it became obvious that the Earth's surface consisted of a mosaic of crustal plates that were continually jostling one another. If the Earth was not to be blown up like a balloon by the continual influx of new volcanic material at the ocean ridges, then old crust must be destroyed at the same rate where plates collide. The required balanced occurs when plates collide, and one plate is forced under the other to be consumed deep in the mantle. 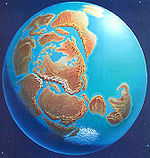 Theoretic position of the continents during the precambrian. It is believed that the unusual magnetic orientation pattern of sea floor rocks is due to repeated reversals of the Earth's magnetic field when the rocks were cooling from molten material. According to this model, the magnetite grains in the magma (molten rock) will align themselves with the orientation of the Earth's magnetic field while in a fluid state. When magma cools, the alignment of the magnetite grains is fixed, effectively recording the Earth's magnetic orientation or polarity (normal or reversed) at the time of cooling. If this interpretation of magnetic striping is correct, the striped pattern of sea floor rocks offers support for the theory of continental drift, which many creationists believe occurred as a result of catastrophic plate tectonics during the Biblical flood of Noah. Radiometric dating of sea floor rocks using potassium-argon dating method has also revealed a correlation between the distance of the rocks from the mid-oceanic ridge and the quantity of unstable isotopes in the sample. Creation scientists, such as Russell Humphreys have proposed that strong flows of the fluid in the Earth’s core could produce enough of a disturbance to result in rapid magnetic reversals during the global flood (dynamic decay theory). ↑ Rift in the Ocean Floor by the U.S. Geological Survey. ↑ Magnetic stripes and isotopic clocks by the U.S. Geological Survey. ↑ Humphreys, D.R. 1986. Physical mechanism for reversals of the Earth;s magnetic field during the flood. Proceedings of the second international conference of creationism, Vol. II (Pittsburgh: Creation Science Fellowship) pp. 129-142. Geomagnetic Reversals and Their Significance to End Time Events by Patrick Young, Ph.D. This page was last modified on 22 December 2011, at 14:11.